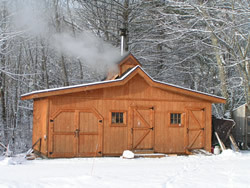 If you see steam in the spring we are making syrup so stop in and say hello. Its best to call ahead if you are planning to stop in to make sure we are open/ boiling. Sample some syrup and grab some for your breakfast along with some other confections to satisfy your maple craving. We also have honey from our local hives and fresh eggs when the hens feel like laying. If we have leftover veggies after we take our cut they will be in the farm stand.